Shaker Card using Christmas Greetings Thinlits Dies + Holly Jolly Stamp set by Stampin' Up! 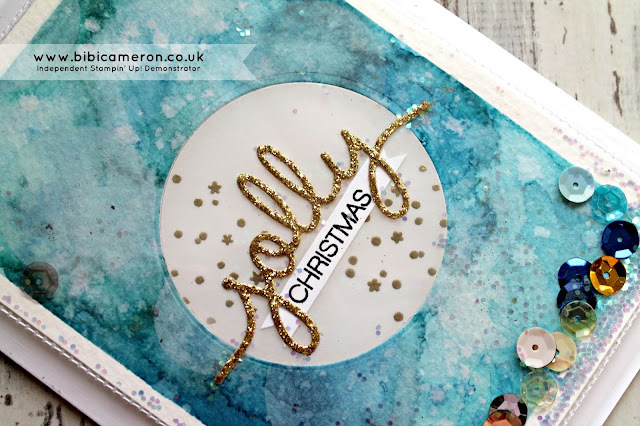 Happy Sunday lovely crafters, I'm saying godbye to the week with a Christmas card because Xmas is NOW! I guess we all of us are getting ready for the season frenzy. Today I have used “Holly Jolly Greetings Clear-Mount Bundle" from Stampin’ Up! The bundle contains 1 stamp set with 22 cling stamps: "Holly Jolly Greetings" and coordinating dies: "Christmas Greetings Thinlits Dies", You can buy them together and save 15% of your purchase or individually. I'm loving the dies as they are just stunning and add great interest to craft projects (cards, boxes, candles, cupcakes tags... etc). I hope you like them to! This card may seem a bit complex but is really easy to make indeed once we have all the elements ready to put them together. It is also a quite of enjoyable project as water-colouring is so sooo relaxing! You can seat with a cuppa and make a pile of backgrounds and put some cards together the next day. That what I did in this opportunity. 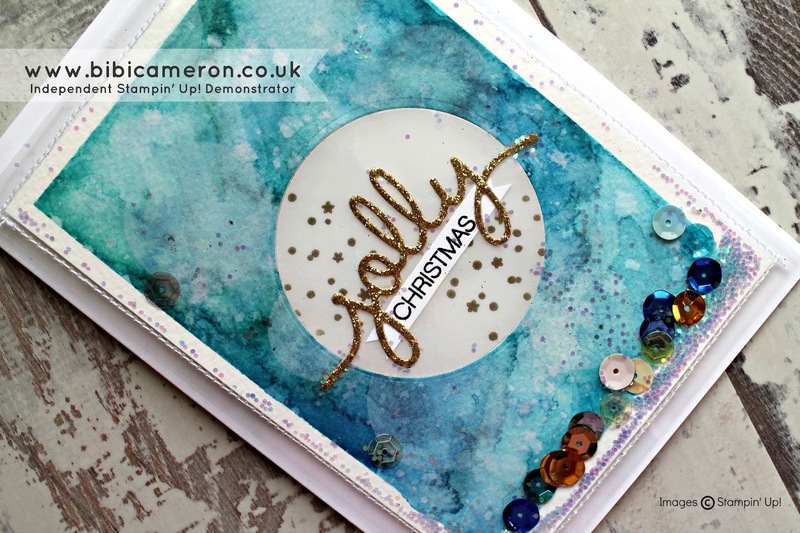 For the watercolour background I used Stampin Up blue inks : Nigh of Navy, Bermuda Bay and pool party. I create the distressing effect by Appling the watery ink colour randomly on watercolour paper and when they dried I splash water drop on top with a brooch to create those little white spots and destress even more. I also used Stazon white ink to create some rough white patches on top as well. I die cut a circle of about 2-1/2" (6.5cm) in vellum and I stamped the little stars and dots from "Holly Jolly Stamp set" using clear Versamark ink and gold embossing powder. I cut the word: "Jolly" using the "Christmas Greeting dies" and apart I stamped the word: "Christmas" with black Stazon ink and I trimmed the little banner by hand. I used the same 2 -1/2 circle die to cut a circle in the middle of the blue background and then I placed and paste everything together on a layer of whisper white card stock using multipurpose liquid glue ( the best glue ever). I sandwiched this between 2 layers of window sheets ( 4 -1/42 x 6-1/4" or 11x16cm) and I sewed around 3 of the 4 edges. I didn’t sew all around to leave an overture to add sequins and glitter and once I finish inserting these elements I sew the other edge. I pasted the whole window - shaker panel on top a thick whisper white card stock base and voila! I was done. Please find supply materias I used to create this card or click here to order online stampin up suplies anytime and support my carfting activity!